A recent report in the East Oregonian newspaper indicated that Rabobank, a Dutch agricultural lender, reported that Greg te Velde, owner of Lost Valley Farm, had defaulted on part of $60 million in loans for the Boardman dairy and two other dairies te Velde owns in California. "John Top, owner of Toppenish Livestock, said they will begin preparing next week for the auction, which is scheduled for April 27," the article stated. "However, according to a preliminary injunction filed in Morrow County, te Velde has not given the auctioneer permission to enter the dairy." Today (Thursday, 4/5/17) I was able to reach Cody Buckendorf, Operations Manager at Toppenish Livestock, who said that that the auction company had been given access to the property and an on-site auction was going ahead on Friday, April 27th. He said that their first day on the property to process cows prior to auction was yesterday, (Wednesday, April 5), and that the bank was estimating there would be as many as 19,000 cows auctioned. 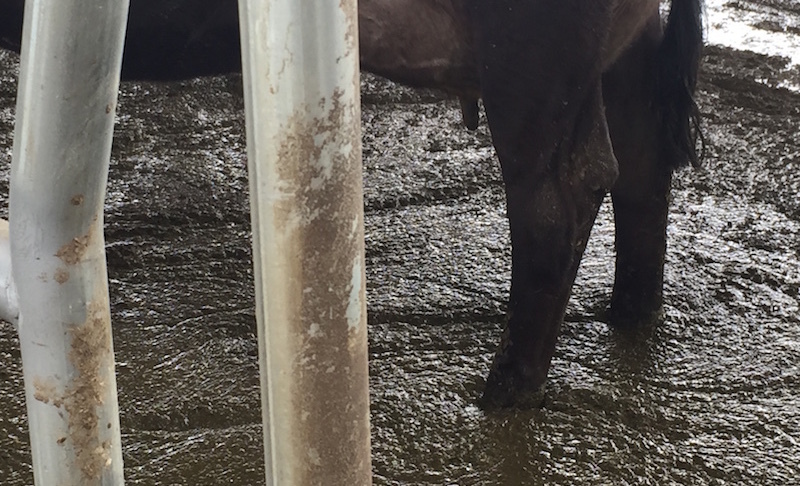 When questioned about the conditions he observed at the dairy, he said that, contrary to the photos taken by the inspector that led to its shutdown (photo, above), "it was one of the cleanest dairies I've seen." Reached by phone, Andrea Cantu-Schomus, Director of Communications for the Oregon Department of Agriculture (ODA), said that within days of te Velde agreeing to a stipulated judgement by Multnomah County Circuit Judge Stephen Bushong that the dairy limit wastewater production to 65,000 gallons a day and ensure its manure lagoons have enough capacity to handle water from storms, the problems documented by ODA inspectors "had been rectified." She added that as long as Lost Valley is running a Confined Animal Feeding Operation (CAFO) under Oregon Administrative Rules, the ODA will be enforcing the CAFO permit and following the guidelines of the stipulated judgement, which includes weekly inspections by ODA inspectors. Read my coverage of the problems at Lost Valley Farm that led to the auction. My article Big Milk, Big Issues for Local Communities reports on the issues mega-dairies pose to Oregon's air, water, environment and communities. You can also find out Why I'm Quitting Tillamook Cheese and read other coverage about factory farms in Oregon. Photo obtained via a public records request by Friends of Family Farmers. I feel badly for those cows. Yes. As an organic dairy farmer said to me, the facilities at these factory farms are "absolutely amazing in scope and absolutely depressing in biology."